How many balloons would it take to lift a house? Home » GreatDad Blog » How many balloons would it take to lift a house? Disney Pixar’s Up is coming out on video on November 10. I saw this with my wife, kids and their grandma and everyone had a great time. Up! is another winner in classic Pixar fashion, with incredible graphics, a fair amount of sentimentality (the first part is a little too maudlin for me) and a lot of good humor. No, it’s not a post-modern wink at popular culture like Dreamworks films like Shrek, but there are some very very funny parts in here that will keep everyone entertained and repeating key lines for weeks afterwards. If you’ve seen any of the ads, you’ll know this is a key shot from the movie. And it certainly stimulates the imagination. Here are a few fun facts from their publicity agency that might come in handy when your kids quiz you on why they don’t fly away when they get a balloon on their birthday, or how many balloons it would take to lift a small child. Have you ever wondered how many helium balloons it would take to lift different objects Up into the air? • How big are the balloons? • How heavy is the object? • How quickly to do you want the object to rise Up? We have come Up with a general formula you can use to figure out how many balloons it would take to lift… well, just about anything! • Helium has a lifting force of about 1 gram per liter. • An average size party balloon is approximately 30cm (one foot) in diameter. • It can hold approximately 14 liters. • That’s 14 grams of lift power per balloon. • Estimate and subtract the weight of the string and the latex balloon. • Formula: 1 balloon = 10 grams of lift power. A happy Labrador Retriever dog weighs in at about 32 kg (70 lbs). It would take approximately 3200 balloons to lift this furry friend off the ground. to turn a 2-wheeler into an air-bike. The average weight of a Sumo wrestler is approximately 148 kg (or 326 lbs). That means it would take about 148,000 balloons to send this guy Up. This figure can vary in terms of quantity of balloons given the size and scale of the house. 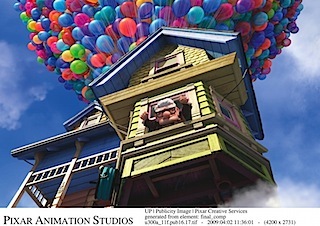 Let’s say the house in Disney/Pixar ’s movie Up weighed about 46,000 kg (that’s 101,413 lbs). That means it takes approximately 4,600,000 balloons to send Carl’s home Up and away!